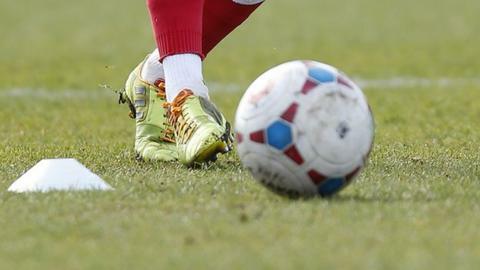 Ilkeston FC have been suspended from the Northern Premier League following a breach of the league's rules. The league said the club "will not be able to participate in any footballing activity" until the breach is resolved. A club statement said the debts owed were being chased due to speculation they would receive a sell-on fee from the sale of former striker Che Adams from Sheffield United to Birmingham. Reports have stated Adams joined the Championship club for around £2m. Adams joined Sheffield United from Ilkeston on a two-year deal in November 2014 but the Northern Premier League Premier Division side would not comment on the extent of the sum they will receive. "Speculation that we have seen is (sadly) way off the mark, and we will be receiving a lot less than is being mooted - but nonetheless the sum received will be put to good use in not only clearing any historic debts but also assisting the club's stability going forwards," the club statement said. Ilkeston have the right to appeal to the Football Association as well as the league itself and said the suspension will be lifted provided they are able to "pay the football clubs what they are due".